The Deep Space Nine rank sets used in Nova were created by Kuro-chan of Kuro-RPG. The ranksets can be found at Kuro-RPG. Please do not copy or modify the images. Content on this site belonging to the USS Endeavour or Pegasus Fleet may not be used without the expressed written permission of the CO or Pegasus Fleet. 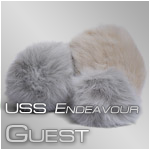 All content, except where noted, is © 2009-2013 USS Endeavour, All Rights Reserved, and is protected under copyright laws. Actor and character uniform photographs' copyrights are owned by the original photographers, and credit for their manipulation goes to the artist responsible - whether it be the player of the character involved or a third party. Manipulated images should not be re-used without the artist's permission. The literacy work produced by the members of this simulation, including character biographies, is the intellectual property of its author and should not be reproduced without their permission.